Georgia Governor Nathan Deal has said that violent offenders will remain behind bars, but the state needs to rethink the costs of locking up others, like nonviolent drug offenders. Last May we noted that Georgia spends a billion dollars a year to keep the fourth-largest number of prisoners of any state. Now that the state is cutting every other budget, including huge cuts in education, we just can't afford to lock so many people up. "Either we're the most evil people on earth, or we're doing something wrong." 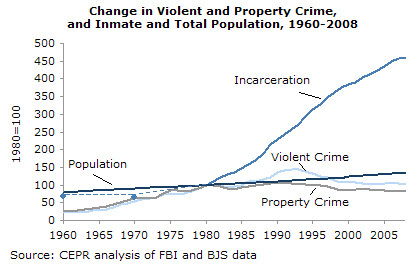 Most of that prisoner growth since 1980 has been in the states, and most of that has been in the south. Now, Texas has a new swagger that comes from a recently released U.S. Justice Department report showing the growth of the state's prison population is slowing to the extent that three new prisons slated for construction have been scrapped. At the same time, the state is becoming the unlikely new role model for a prison reform movement spreading across the country. State Rep. Jerry Madden, R-Plano, and state Sen. John Whitmire, D-Houston, worked across partisan lines to implement the “reinvestment movement” in 2007, which they say is just starting to show results. The program invests state funds in drug, alcohol and mental health programs to treat offenders rather than just prisons to house them. What if instead of building a private prison we invest in getting people jobs when they get out of jail? We could get out in front of this prison reduction movement instead of continuing down a known dead end. Producing a local industry of preventing incarceration and reducing recidivism could provide local jobs that could possibly even generate training revenue as other states realize they can't keep spending their children's education money on locking them up instead.